Yad Vashem Exhibit to Open at the United Nations Marking International Holocaust Remembrance Day. On Tuesday, January 26, 201o a new exhibit of the recently uncovered blueprints of the Auschwitz-Birkenau World War II death-camps will open at the United Nations Headquarters in New York. 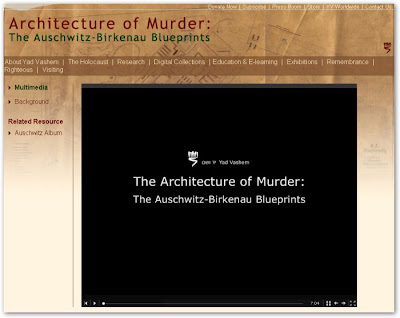 The Yad Vashem exhibit; “Architecture of Murder – the Auschwitz-Birkenau Blueprints” displays the blueprints prepared by the Nazis as they planned the construction of the Auschwitz-Birkenau extermination camps. The Nazis produced hundreds of technical sketches of various building sites, among them detailed sketches of the gas chambers and crematoria. 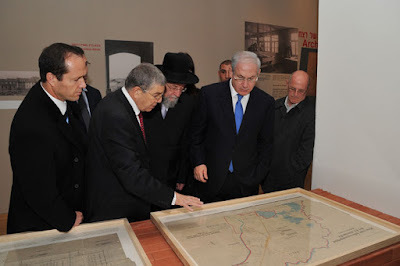 These plans led to the construction of the largest extermination center of European Jewry. In 2008, twenty-nine original yellowing drawings were found in an abandoned apartment in Berlin, including 15 original plans of the Auschwitz complex. 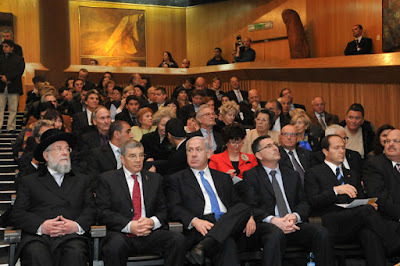 They were acquired by the Axel-Springer publishing house and presented last August to Prime Minister Benjamin Netanyahu for safe-keeping at Yad Vashem, the Holocaust remembrance and education center in Jerusalem. This important exhibit is being shown simultaneously in Jerusalem, where it will open on January 25th, and at the United Nations Headquarters in New York, opening on January 26th. It marks the United Nations International Day of Commemoration of the Holocaust. Attending the opening at the United Nations will be UN Secretary General Ban Ki-Moon, Israel’s Minister of Information and Diaspora Yuli Edelstein, Israel’s Ambassador to the United Nations, Prof. Gabriella Shalev, Poland and Germany’s Ambassador to the U.N., Mr. Eli Zborowski, Chairman of the American and International Societies for Yad Vashem, community leaders, ambassadors, and members of the diplomatic corps. The “Architecture of Murder” exhibition will be displayed at the UN through March 1, 2010 and is supported by Israel’s Ministry of Foreign Affairs and Michaela and Leon Constantiner. “Architecture of Murder” was curated by the Director of Yad Vashem’s Museums Division Yehudit Inbar and designed by Pnina Friedman. Ms. Inbar will introduce the exhibit at the United Nation’s opening. An official reception by invitation only, will mark the opening on Tuesday, January 26th at 6:00 p.m. at the United Nation’s Visitor’s Lobby and will remain on display through the end of February, 2010. It is made available through the auspices of the American Society for Yad Vashem, Inc. (212) 220-4304, Eli Zborowski, Chairman. 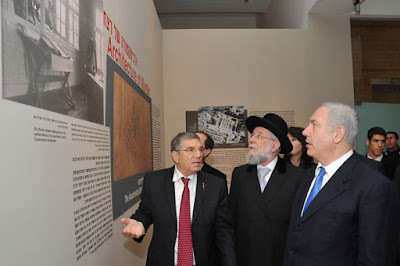 Chairman of the Yad Vashem Directorate Avner Shalev explains a display in the exhibition to Prime Minister Netanyahu as Chairman of the Yad Vashem Council Rabbi Israel Meir Lau looks on.